Quebec’s Olivier Ménard is one of three athletes from the province to make the national junior squad. 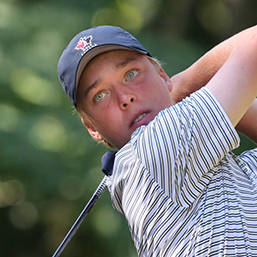 The Salaberry-de-Valleyfield, Que., native joins the team after a season that featured top-five finishes at the CCAA Championship, Canadian Junior Boys Championship, Future Links, driven by Acura Quebec Championship, Quebec Amateur and the Quebec Junior Provincial Match-Up. Ménard was named All-Canadian for his efforts with the Cégep André Laurendeau. I usually go by Oli. I watched my dad hit some golf balls when I was young so later I decided that I wanted to play as well and it all started from there. I put a blue line on the pro V1x. I have a brother he is 16 years old. Tiger Woods’ How I Play Golf. Pretty good at ping pong and I used to play high-level hockey. Cardio stuff is the worst! Picture of my school golf team. They have the best hockey rink in the area. I don’t play with Titleist 1 in tournaments.